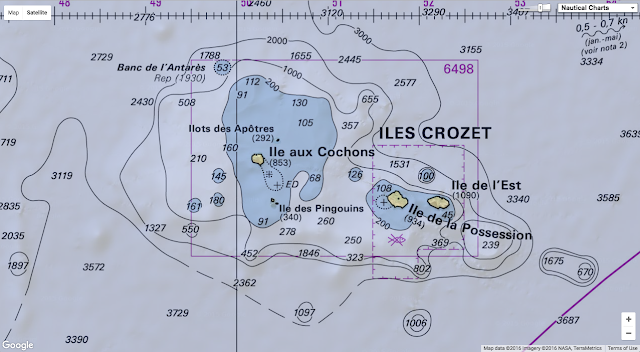 In some areas, the maps used for navigation on the ocean, called nautical charts, still show information acquired in the 1800s, so there is a LOT of work to do! In this video, we see how NOAA’s National Ocean Service is leveraging new technology to complete a task begun long ago: mapping the world’s oceans. The vast majority of nautical charts were predominantly created manually by sailors and cartographers who didn’t have access to the kind of exacting measurements modern imaging tools can provide. As such, there are gaps in the existing charts and areas lacking in details. Some charts haven’t been updated since the 1880s. Given that storms can shift sandbars and once-deep water may have grown shallower over time, this is not just an academic endeavor—inaccurate charts pose real dangers for sailors. And, of course, there’s the inherent curiosity about what’s what down there. NOAA’s bringing a range of technologies to the process. They’re using planes and ships to map the deep ocean floor, and for any place that’s too snug or shallow for larger craft, an autonomous surface vehicle, or ASV, is sent in to handle the job. These sled-sized little boats can be controlled remotely, or programmed to map out an area automatically over a period of hours or even days. Researchers and policymakers from Arctic and fishing nations aim to make science-based decisions on fishing in the Central Arctic Ocean to prevent the depletion of newly navigable international waters. Last week, delegates from six Arctic nations and other countries with major fishing fleets met in Washington, D.C., to discuss plans to prohibit commercial fishing in the central Arctic Ocean until scientists can find out more about the fish stocks and how they are changing. "Fishing shouldn't occur up there until we have the science and the rules in place," said Scott Highleyman, director of the International Arctic Program at The Pew Charitable Trusts. No commercial fishing occurs in the high seas of the Arctic Ocean yet. The 2.8m square kilometer area (1.08m sq. mile) region surrounds the North Pole. It is referred to as the high seas because it lies beyond the 200 nautical mile limit of the Arctic nations. Without regulations, it is permissible for fishing fleets to cast their nets within these waters. Until recently, the area has been largely impenetrable to fishing fleets. According to satellite records spanning 1979-2000, this high seas area remained ice covered throughout the year, even during the summer. But in the past decade, summer sea ice has retreated dramatically. During the summers of 2007 and 2012, as much as 40 percent of the Central Arctic Ocean – particularly the waters adjacent to Canada, Russia and the United States – was open water, Highleyman said. Permanent ice has given way to navigable seas and seasonal ice, he added. In August 2015, the five Arctic countries with coastlines bordering the Arctic Ocean – Canada, Denmark, Norway, Russia and the United States – signed a voluntary agreement to bar commercial fishing in the Central Arctic Ocean. The declaration, signed in Oslo, is a voluntary agreement between the nations to keep commercial fishing vessels out of the region until scientists have improved their understanding of the region and can produce science-based assessments of the fish stocks and distribution. Last week, Canada, China, Denmark, the European Union, Iceland, Japan, South Korea, Norway, Russia and the United States met to discuss ways to bring other countries in on the agreement – or to create a new one. China, Japan and South Korea are all observers to the Arctic Council, and the European Union's status within the organization is pending. The Central Arctic Ocean is a 2.8 million square kilometer area (1.08 million square miles) of international waters that lie beyond the 200 nautical mile boundary. China, for example, captures more fish than any other country. In 2012, its fishing vessels captured almost 14 million tonnes (15.4 million U.S. tons) of marine fish globally, a 13 percent increase in a decade, according to the U.N.'s Food and Agriculture Organization. Pollution and overfishing near China's coast – and high demand for fish – are driving its fishing vessels into more distant waters, according to a 2012 report by the European Parliament. The report found China was aiming to increase its distant-water fishing fleet to 2,300 vessels by the end of 2015. In contrast, other nations are decreasing their fishing fleets to address overfishing. Some researchers, including Daniel Pauly, from the University of British Columbia, warn that China's long-distance fishing fleet may be under-reporting its catch. In a 2013 study, he and his colleagues estimate that China's long-distance catch may have been as much as 4.6 million tonnes per year from 2000-11, more than 12 times the reported catch of 368,000 tonnes per year. Non-Arctic nations are interested in access to shipping routes, natural resources and fishing, making it important to include them in any discussions about future fishing in the Central Arctic Ocean. There are concerns that in the absence of an international agreement that the region could become quickly overfished. "As the sea ice starts to melt and the high seas of the Central Arctic Ocean become accessible for the first time in human history, how do we approach it? The idea of doing the science first and crafting the rules before we start is a really good idea," Highleyman said. At present, there is "zero" evidence that commercially interesting fish stocks will extend in the Central Arctic Ocean, Highleyman said. Part of the reason for that is that no one has surveyed them. Researchers have studied the bottom and top of the food chain, studying phytoplankton and seabirds and mammals, respectively, but not the fish that occupy the middle rungs, he said. "It wouldn't take very many boats to wipe out populations before we know what they are," Highleyman said. Arctic cod, Boreogadus saida, swimming among sea ice north of Barrow, Alaska. In the 1970s and '80s, South Korea, China, Poland, Japan and other countries hauled millions of tonnes of pollock from the international waters in the central Bering Sea between Alaska and Russia. A conservation agreement was signed in 1994, closing the area to pollock fishing until the stock rebounded. It has yet to recover. Scientific experts from the Arctic coastal states and the additional nations have held meetings in parallel with the ongoing policy meetings, to share information on Arctic fish stocks and to develop research and monitoring priorities for the Central Arctic Ocean. One of the key questions they hope to study are the links between fish stocks and the adjacent ecosystems. The policy talks are discussing three different possible approaches: modifying the signed declaration to include other nations in a non-binding agreement; drafting a new binding international agreement; and negotiating the creation of a regional fisheries management organization. All three could also be combined in a "stepwise" approach. Both the United States and Canada support a binding agreement on Arctic fisheries. "It will fill an important gap in the ocean governance system," Karmenu Vella, the European Union's commissioner for the environment, fisheries and maritime affairs, said in a statement. The next round of negotiations will be held in Iqaluit, Nunavut, in July. Lazzarini is also currently developing a U.F.O. prototype which in this case stands for Unidentified Floating Object. The vessel is actually a futuristic sustainable house boat with multiple levels, spacious living zones and a submerged glass encased lower bedroom. "It's a floating solar powered house with a 12 hp electric engine that is able to move the floating structure for short distances," explains Rasini. While you can always head for the hills to wait out the apocalypse, a more stylish option could be a fully sustainable floating home from Italian mini yacht-maker Jet Capsule. The company has drawn up a concept for a saucer-shaped UFO, or Unidentified Floating Object, which offers a completely off-grid existence floating on the ocean. According to the company's co-founders, Pierpaolo Lazzarini and Luca Solla, the UFO is intended for "living in a floating house and moving slowly around the world." "Slowly" in this case means a leisurely maximum speed of 3.5 knots (6.5 km/h, 4 mph), using a waterjet-propelled Torqeedo Deep Blue 1800 electric motor. Generally, the orb-shaped home will consist of a transformable kitchen and dining/living area on a 20-sq. m (215-sq. ft.) top level, with stairs leading down to a 10-sq. m (107-sq. ft.) submerged lower level with bathroom and bedroom surrounded by a large window for viewing sea life. To keep the craft stable, the UFO uses a special elastic anchor system. "The main structure of the floating object can be aligned with the compass, keeping the position angle oriented on the desired cardinal direction, even in rough sea conditions," say the designers. Carta marina, a wallmap of w:Scandinavia, by Olaus Magnus. The caption reads : Marine map and Description of the Northern Lands and of their Marvels, most carefully drawn up at Venice in the year 1539 through the generous assistance of the Most Honourable Lord Hieronymo Quirino. 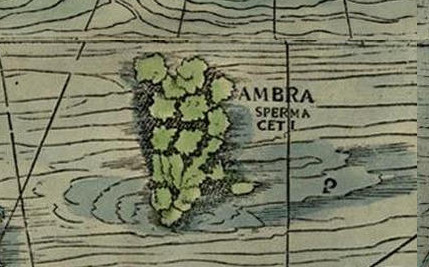 The creatures depicted on land in the 16th-century Carta Marina are not particularly unusual: the map's lands contain knights on horseback, wild boars and bears climbing trees. The west side of the map, however, shows a much more fanciful plethora of wildlife. Cartographer Olaus Magnus created the Carta Marina while staying in Rome, between the years 1527 and 1539. However, Magnus was originally from Sweden, and chose to depict the Nordic countries in his map. The Carta Marina was one of the most precise depictions of any part of Europe at the time—although its portrayal of the oceans was not quite as accurate. 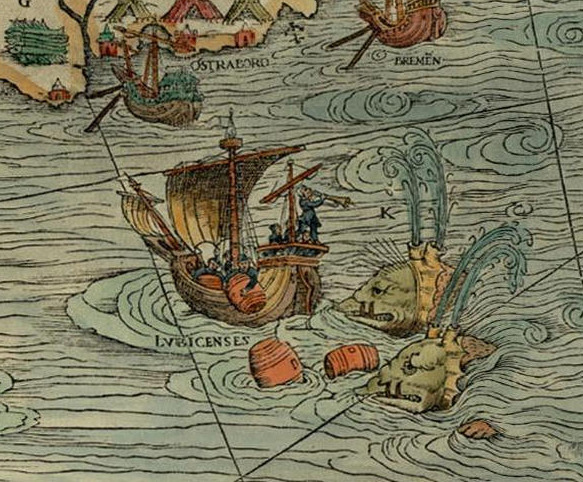 The northern seas on the map are filled to the brim with all kinds of aquatic monsters. Some maps of the era depicted dragons to metaphorically indicate uncertainties or dangers in a region. But the Carta Marina's mythological sea creatures were thought to really exist at the time Magnus drew them. He even identified each creature in the map's key. You can take a closer look at some of them below. 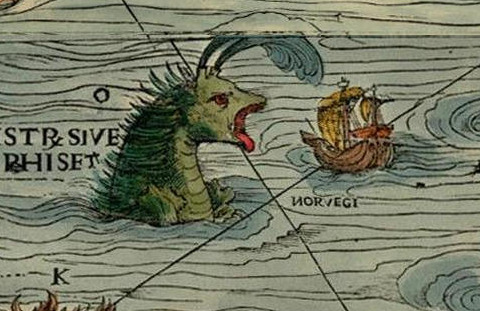 Unsuspecting sailors cook a meal on a sea monster off the coast of Iceland. Magnus described this creature as a whale whose skin resembled the sand on a seashore. An English ship is depicted as having laid anchor on the whale, and two unwitting sailors are cooking a meal on its rump. Sailors attempt to scare away attacking sea monsters with frightening sounds and empty barrels. 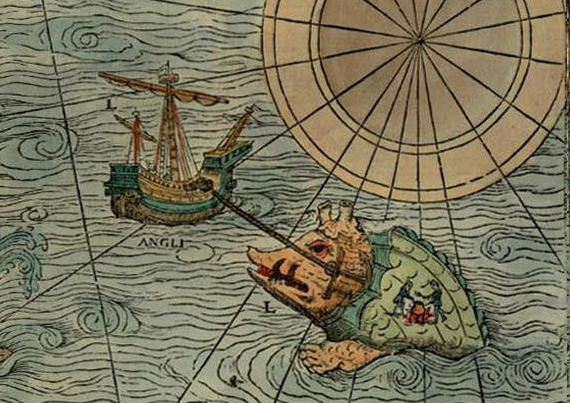 Just beneath Iceland, the Carta Marina offers up a curious sight: a sailor aboard a ship, playing the trumpet for two sea monsters. The sounds, along with the empty barrels shown, could have been a futile attempt to scare away the attacking beasts. A vividly red sea serpent envelops a ship that came too close for comfort. Magnus explained that the fearsome sea serpent above was over 200 feet long, and over 20 feet thick, and lived off the coast of Bergen, within its caves and hollows. 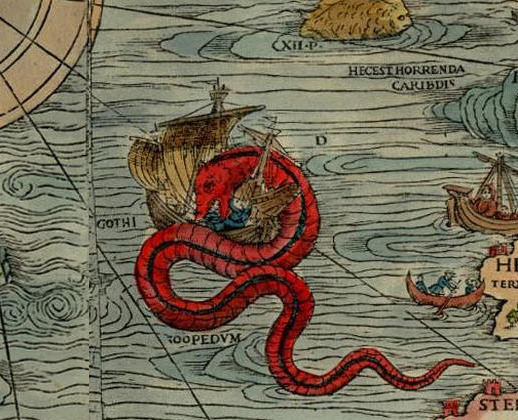 The infamous Leviathan appears on the western edge of the map. One of the more recognizable shapes on the Carta Magna is the Leviathan, a sea monster that has been documented since the Old Testament days. 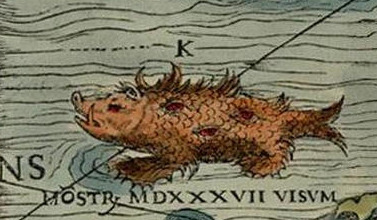 In the map, only the creature's head is shown emerging from the sea, but Magnus describes its whole length to be over 300 feet long. If pigs could swim, this is what they would look like. Below the Leviathan is a "monstrous pig" that is claimed to have been spotted in the North Sea in 1537. ...and if owls couldn't fly. 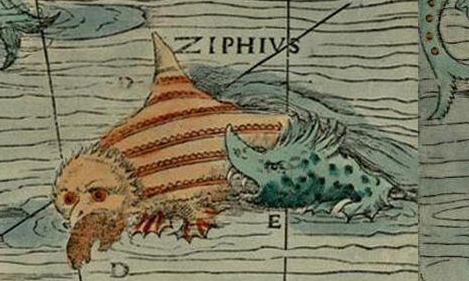 One can hardly ignore this bizarre swimming owl, the xiphias, which is being attacked by a rhinoceros-type creature that sinks ships by swimming beneath them and cutting into their hulls. Ambergris is a highly valuable substance even today. This is not technically a monster, but rather an absurd phenomenon. These green lumps make up a large chunk of ambergris, a highly prized mix of whale vomit and feces that still sells for exorbitant prices today. Chinese Prime Minister Li Keqiang looks at a map of the port of Piraeus, where Chinese shipping giant Cosco controls two of the three container terminals, on Friday June 20, 2014. In the 18th and 19th centuries, the sun famously never set on the British empire. A commanding navy enforced its will, yet all would have been lost if it were not for ports, roads, and railroads. The infrastructure that the British built everywhere they went embedded and enabled their power like bones and veins in a body. Great nations have done this since Rome paved 55,000 miles (89,000 km) of roads and aqueducts in Europe. In the 19th and 20th centuries, Russia and the United States established their own imprint, skewering and taming nearby territories with projects like the Trans-Siberian and the Trans-Continental railways. Now it’s the turn of the Chinese. Much has been made of Beijing’s “resource grab” in Africa and elsewhere, its construction of militarized artificial islands in the South China Sea and, most recently, its new strategy to project naval power broadly in the open seas. Yet these profiles of an allegedly grasping and treacherous China tend to consider its ambitions in disconnected pieces. What these pieces add up to is a whole latticework of infrastructure materializing around the world. Combined with the ambitious activities of Chinese companies, they are quickly growing into history’s most extensive global commercial empire. China views almost no place as uncontested. Chinese-financed and -built dams, roads, railroads, natural gas pipelines, ports, and airports are either in place or will be from Samoa to Rio de Janeiro, St. Petersburg to Jakarta, Mombasa to Vanuatu, and from the Arctic to Antarctica. Many are built in service of current and prospective mines, oilfields, and other businesses back to China, and at times to markets abroad. But while this grand picture suggests a deliberate plan devised in Beijing, it also reflects an unbridled commercial frenzy. Chinese companies are venturing out and doing deals lacking any particular order. Mostly, they’re interested in finding growth abroad that is proving difficult to manage at home. This, too, is typical for a fast-growing power. “This is very much in line with what we would expect from other great powers whose military posture follows its economic and diplomatic footprint,” Lyle Morris, a China specialist with Rand, told Quartz. In September 2013, newly anointed Chinese leader Xi Jinping visited Kazakhstan’s capital, Astana. He was in town to seal the Chinese purchase of a $5 billion stake in Kashagan, one of the world’s largest oilfields. On that trip, he unveiled a plan ultimately dubbed “One Belt, One Road”—a land-and-sea version of the fabled East-West Silk Road trading route. The idea is audacious in scope. On land, Beijing has in mind a high-speed rail network (map 2). It will start in Kunming, the capital of Yunnan province, and connect with Laos and on into Cambodia, Malaysia, Myanmar, Singapore, Thailand and Vietnam. Another overland network of roads, rail and energy pipelines will begin in Xi’an in central China and head west as far as Belgium (see dotted brown line above). As we’ve written previously, Beijing has already initiated an 8,011-mile cargo rail route between the Chinese city of Yiwu and Madrid, Spain. Finally, another 1,125-mile-long bullet train will start in Kashgar and punch south through Pakistan to the Arabian Sea port of Gwadur. The thinking behind this rail-driven plan isn’t new–as we have written previously, Beijing has been piecing it together for awhile. At sea, a companion 21st-century Maritime Silk Road (see dotted blue line in map 1) would connect the South China Sea, and the Indian and South Pacific oceans. 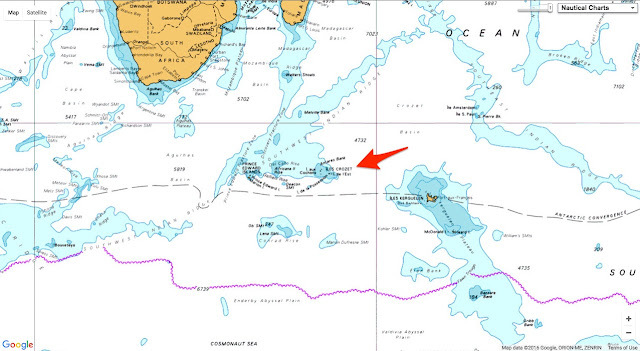 China would begin to protect its own sea lanes as well. On May 26 it disclosed a strategy for expanding its navy into a fleet that not only hugs its own shores, but can wander the open ocean. Everywhere, new public works will be required. And to make its vision materialize, Beijing must be careful to be seen as generously sharing the big engineering and construction projects. Up to now, such contracts have been treated as rare, big profit opportunities for state-owned Chinese industrial units. These include the China Railway Group, whose already-inflated share prices have often gone up each time another piece of the overseas empire has fallen into place. If local infrastructure companies are excluded from the largesse, there will be push-back on almost every continent. In any case, not all this will necessarily happen. In a recent note to clients, China observer Jonathan Fenby of the research firm Trusted Sources suggested that it may all be too ambitious. China has had a history of announcing and then shelving projects, such as a $3.7 billion railway canceled by Mexico in February amid allegations of local nepotism. Meanwhile, Japan has begun to challenge Chinese plans. It has launched rival bids for billion-dollar high-speed rail and other projects in Indonesia, Thailand and elsewhere, with relatively low-interest loans and sometimes better technology (paywall). But Beijing seems to recognize its own limits. Rather, the world may help to build at least some of the infrastructure through another Chinese creation—the Asian Infrastructure Investment Bank, with its 57 founding members, modeled loosely on the World Bank. Projects backed by the bank are meant to be good for the country where they are built. But given China’s outsize influence in the institution, they are certain to include some that fit into its grand scheme of global infrastructure. China’s South American railway project, which cuts through the Amazon rainforest. Xi has pledged $250 billion in investment in South America over the next 10 years. The centerpiece is a $10 billion, 3,300-mile, high-speed railroad (dotted red line above) that would start in Acu, near Rio de Janeiro, crossing the Amazon rainforest and the Andes Mountains, and terminate on the Peruvian coast. In January, China agreed with the African Union to help build railroads (map 4), roads, and airports to link all 54 African countries. These plans are already under way, including a $13 billion, 875-mile-long coastal railroad in Nigeria; a $3.8 billion, 500-mile-long railroad connecting the Kenyan cities of Nairobi and Mombasa; a $4 billion, 460-mile railway linking the Ethiopian cities of Addis Ababa and Djibouti; and a $5.6 billion, 850-mile network of rail lines in Chad. Then there are China’s maritime ambitions. These envision modern ports in the Tanzanian capital, Dar es Salaam; the Mozambican capital, Maputo; Libreville, Gabon; the Ghanaian city of Tema; and the Senegalese capital, Dakar. All these land and marine projects align with existing Chinese natural-resource investments on the continent. For example, the China National Petroleum Corporation (CNPC) has large oil projects in Chadand Mozambique, and Chinese manufacturers are fast setting upEthiopian factories that rely on cheap local labor. In addition to its planned high-speed rail network into Malaysia and Singapore (map 2) and Laos (map 5) into southeast Asia (see map 5 for Laotian portion), China plans a canal across the Isthmus of Kra in Thailand, a deep-water container port and industrial park in Kuantan, Malaysia, and a $511-million expansion of Male airport in the Maldives. China wants to dominate not only the South and East China seas, but far into the Pacific (map 6). According to the Lowly Institute, transportation comprises by far the largest portion of $2.5 billion in Chinese assistance and commercial credit to South Sea nations. Tonga: A $12 million government building to be called St. George Palace, and two small Chinese turboprop aircraft for domestic routes aboard Real Tonga airlines. The aircraft deal has been controversial because neither of the planes are certified for use in the West. Why has China lavished $42 billion in infrastructure projects on Pakistan? The two have always been allies. But China has a particular goal: It wants to contain Uighur separatists who have been fomenting violence in the western province of Xinjiang. Some of these separatists have sanctuaries in Pakistan and Afghanistan, and Beijing has pushed hard for both countries to hand over Uighurs living there. But sending goods through Pakistan (map 7) also helps China avoid the Malacca Strait (map 8). Much of Beijing’s oil and other natural resources passes through this narrow, 500-mile-long stretch of sea between Malaysia and Indonesia. China worries that, if its relations with Washington become truly hostile, the US could theoretically blockade the strait and starve the country of its lifeblood resources. That is in large part why Beijing is financing a deep Arabian Sea port at Gwadur, and the 1,125-mile-long super-highway, high-speed railway and oil-pipeline route to the Chinese city of Kashgar. Central Asia has been an almost exclusively Russian playground for almost two centuries. It still is when it comes to pure muscle. But in matters of cash, China is fast moving in. The relationship revolves around oil and natural gas. Turkmenistansupplies more than half of China’s imported gas. It gets there throughthree, 1,150-mile-long pipelines; a fourth pipeline is soon to begin construction. China is the only foreign nation that Turkmenistan allows to drill for gas onshore, in particular from Galkynysh, the second-largest gasfield in the world. China’s $5 billion share of the Kashagan oilfield in Kazakhstan is one of its largest oil stakes anywhere. Xi also has signed $15 billion in gas and uranium deals inUzbekistan. Two years ago, Russia announced a pivot towards China. The centerpiece of the shift is two natural-gas pipelines (the larger of the two is the dotted red line in map 9) through which a fifth of China’s gas imports would flow. The deal had some snags, but they reportedly have been worked out, and construction is to begin soon. In addition, China is to build a $242 billion, 4,300-mile high-speed railway from Beijing to Moscow, a two-day trip compared with the current six-day Trans-Mongolian Express. The Maritime Silk Road (the solid blue line in map 10) will enter Europe through a $260 million Chinese-funded upgrade of the Greek port of Piraeus. From there, rail service will continue into the Balkans. Ships from China will also make port in Lisbon, Portugal, and Duisburg, Germany. To take the network into the heart of Europe, Beijing has agreed to finance a 250-mile bullet train, costing up to $3 billion, from Belgrade to Budapest. Separately, China’s new 8,011-mile cargo railroad from Yiwu to Madrid is taking away business from far more time-consuming truck shipping. For now, the Chinese web of infrastructure does not extend to the US. Instead, what has been built elsewhere is serving as a jumping-off point to the gigantic US market. High-speed trains are only now starting to be planned in the US, and Chinese firms are front-runners to win contracts, including a $1 billion contest for the San Francisco-to-Los Angeles route, expected to be worth $68 billion. China’s CNR Corp. is already providing 284 passenger cars worth $566 million to the Boston subway system. Another big splash: the United States is China’s favored destination for real estate investment (see chart above). This has included commercial jewels such as New York’s Waldorf Astoria ($1.95 billion to Angbang Insurance) and the Chase Manhattan Plaza ($725 million to Fosun). But the bigger sums have been spent in all-cash deals by wealthy Chinese for residential properties (pdf, page 12). Chinese oil company Cnooc has a majority share in Iceland’s Dreki oil and natural gas field, and Beijing established the Arctic Yellow River Station, a permanent research facility on Norway’s Spitsbergen Island. In Antarctica, China has four research stations, structures that allow nations to stake a claim to the continent. Plans for a fifth station at a place called Inexpressible Island are under way. It is positioning itself to move for the continent’s resources when a 1959 treaty guaranteeing its wilderness status expires in 2048. Some of the infrastructure China is creating around the world will align with Western economic interests. But to the extent that it does, that will be inadvertent. Some of the most modern transportation infrastructure going up not only in China, but around the developing world, is deliberately linked to China. It is meant to make the global economy a friendly place for Chinese commerce. That does not make China’s ambitions necessarily menacing or pernicious. But it does make them China-centric. It’s worth remembering that this way of doing economic development is not a Chinese invention. A video(2x speed) of a Rhizaria under a phase contrast microscope with 1000x zoom. A team of marine biologists and oceanographers from CNRS, UPMC1 and the German organization GEOMAR have revealed the importance in all the world's oceans of a group of large planktonic organisms called Rhizaria, which had previously been completely underestimated. According to their findings, these organisms make up 33% of the total abundance of large zooplankton in the world's oceans, and account for 5% of the overall marine biomass. The study was carried out on samples collected during eleven oceanographic campaigns (2008-2013) covering the world's main oceanic regions, and included the Tara Oceans expedition. It is published on 20 April 2016 on the website of the journal Nature (print edition 28 April2 ). Although invisible to the naked eye, marine plankton play a key role in the balance of our planet. Still largely unexplored, they consist of an astonishingly wide variety of tiny organisms that produce half the Earth's oxygen and form the base of the oceanic food chain that feeds fish and marine mammals. Rhizarians, from their Latin name Rhizaria, are a group of large planktonic organisms whose importance had been overlooked until now. Most estimates of the distribution of marine organisms are performed locally (in a defined marine area) and are based on collection with plankton nets. However carefully carried out, this operation can damage certain fragile organisms such as rhizarians, preventing their identification. 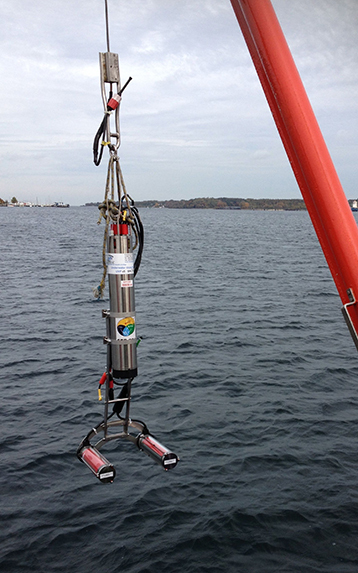 Marine biologists and oceanographers have pooled their skills with the aim of analyzing samples collected during eleven oceanographic campaigns from 2008 to 2013, using a less destructive method, namely an underwater camera deployed at depth. This in situ imaging system, which involved no collection, was used to study the organisms directly in their environment without damaging them. In all, sampling was carried out at 877 stations (corresponding to 1 454 immersions of the camera down to 1 500 meters), covering the world's main oceanic regions. In total, the scientists analyzed 1.8 million images in order to quantify the abundance and biomass represented by Rhizaria3. Deployment of the underwater camera used in this study. The results were surprising: their estimates unequivocally show that Rhizaria make up more than a quarter of the total abundance of the world's large zooplankton. They also found that they account for 5% of the total biomass in the oceans (taking into account all organisms, from plankton to whales). The presence of Rhizaria in all the planet's oceans had previously been completely overlooked. However, they are unevenly distributed: these giant plankton are predominant in the nutrient-poor regions (located at the center of the large oceans) that cover most of the ocean area. This distribution could be explained by Rhizaria's ability to live in association (symbiosis) with microalgae, just like coral. In symbiosis, the partnership between organisms is based on mutual exchange of food: by directly benefiting from the products of photosynthesis, Rhizaria are able to survive in nutrient-deficient waters. 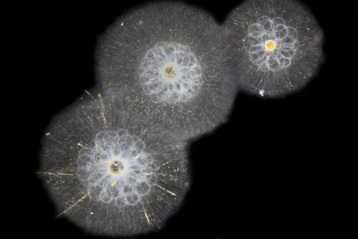 Plankton are gradually giving up their secrets, unveiling unsuspected wealth and diversity. Three rhizarians (Rhizaria) seen through an optical microscope. The small yellow dots seen around the periphery of the organisms are symbiotic algae. Each organism has an average size of 0.2 to 1 centimeter. These types of Rhizaria are solitary and do not form colonies. 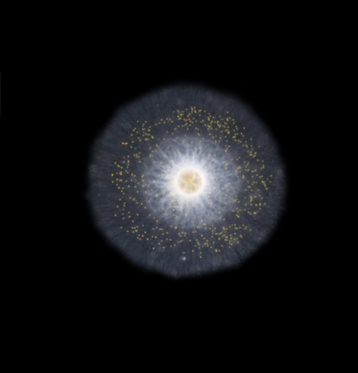 Overall view of rhizarians forming colonies (seen in optical microscopy). Each white dot is an individual member of the colony. The colonies can reach a size of several centimeters. They were collected in the Mediterranean by the Observatoire Océanologique de Villefranche-sur-Mer. A large solitary rhizarian (Rhizaria) (around 0.5 cm) seen through an optical microscope. 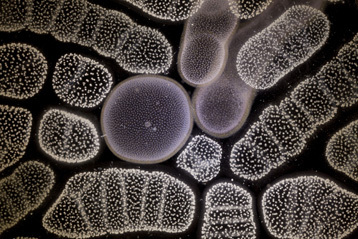 The small yellow dots seen around the periphery of the organism's cell are symbiotic algae. 1 In the “Adaptation et Diversité en Milieu Marin” laboratory (CNRS/UPMC) at the Station Biologique de Roscoff and the Laboratoire d'Océanographie de Villefranche (CNRS/UPMC) located at the Observatoire Océanologique de Villefranche (southeastern France). 3 Those considered in this article have a size comprised between 600 µm (0.6 mm) and a few centimeters (which is large for plankton). The smallest and largest Rhizaria are therefore not taken into account in this study. These estimates are therefore likely to considerably underestimate their real contribution to biomass. HA04 at Crozet Islands in the South Indian Ocean. make this our most complex hydroacoustic project ever. The Comprehensive Nuclear-Test-Ban Treaty Organization (CTBTO) is an international organization that will be established upon the entry into force of the Comprehensive Nuclear-Test-Ban Treaty, a Convention that outlaws nuclear test explosions. 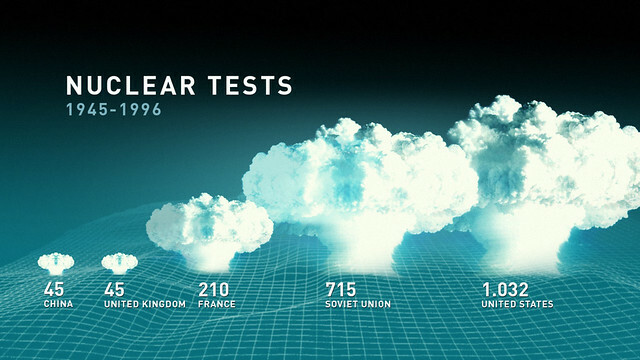 The organization will be tasked with verifying the ban on nuclear tests and will operate therefore a worldwide monitoring system and may conduct on site inspections.